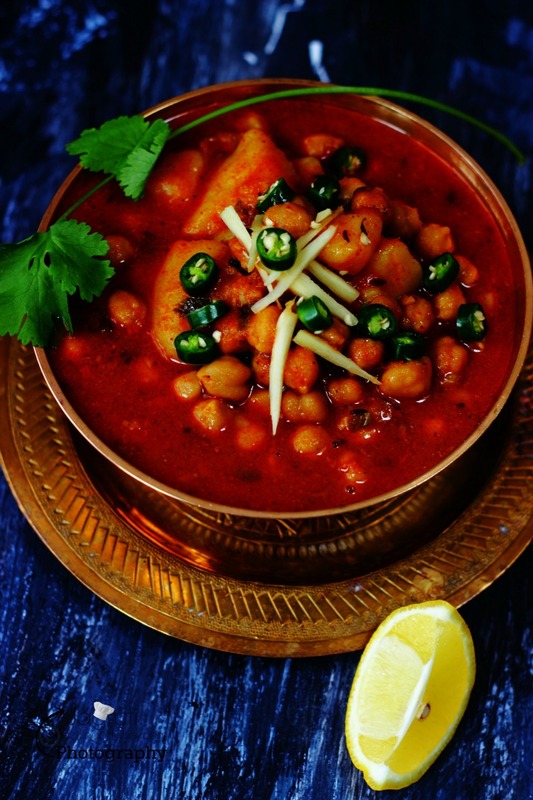 Simple and delicious Aloo Chole or Kabuli Chana Bateta Nu Saak prepared without onion and garlic. 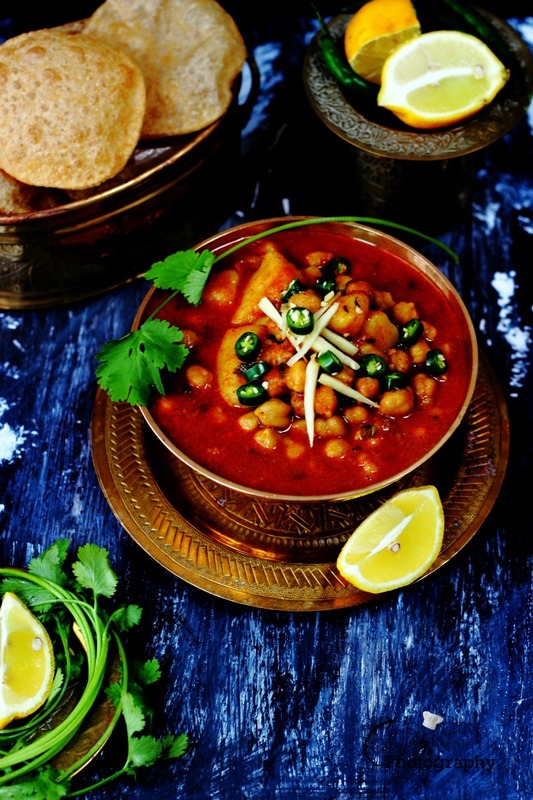 Once in a while you will not miss, typical North Indian Chole when you will try this Aloo Chole, without onion and garlic. 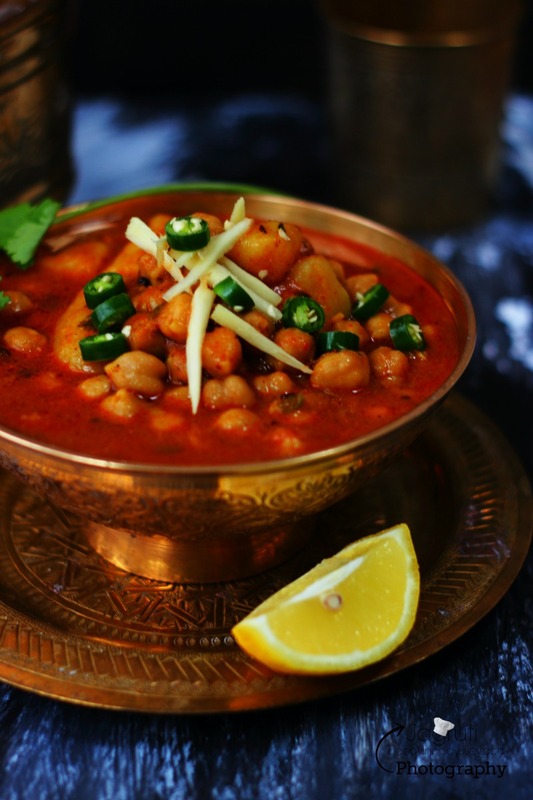 This curry is full on with all flavours and still tastes almost like a Punjabi Chole Masala , surely medley of flavours will be dancing on your tongue with every bite. Very strong flavoured and raw onions are not our idea of a nice surprise at breakfast time. Generally, most of the English wrinkle their noses at the idea of servings of any breakfasts doused with onion and garlic, so does my family! Totally agree, obviously, you want to leave a positive image of yours everywhere. It is important to remember that strongly flavoured foods will remain on your breath for some considerable time after ingestion. Whilst you may enjoy breakfast heavily laced with garlic and onion, your fellow attendees, mates or colleague will not be so appreciative when they are repeatedly exposed to it every time you speak. So in our house, those foods are left for dinner or weekends when a family is at home and strictly forbidden to prepare anything with Onion and garlic at breakfast time! 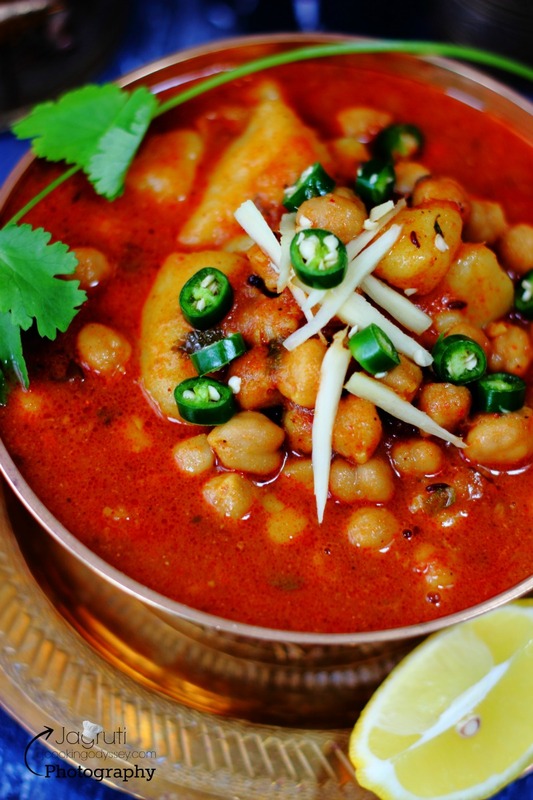 There is no doubt that we do love to have spicy and savoury breakfasts, Various flavoured and stuffed Paratha, Bataka Poha, many south Indian dishes and obviously everyone's favourite Poori and alu ki sabji. Sometimes it would be a dry version or sometimes With lovely gravy ( Rasavala ). Since we have become more health conscious I rarely make Potato curry where I use potatoes on its own, and if I make potatoes curry, other kinds of vegetables or beans would go together. Food without onion and garlic we not only appreciate at breakfast time but also when having religious occasions, these kinds of dishes works really well as we offer to God as Prasad and Prasad should be Satvik. 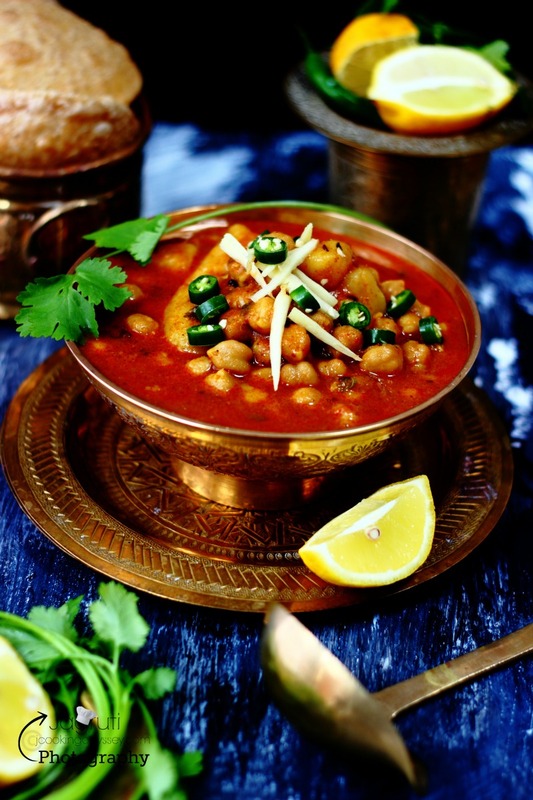 And for devotees, food is not so plain or bland but by using various kind of spices food without onion and garlic still tastes delicious and tasty. Actually, by adding whole spices, you can compensate onion garlic. This Aloo Chole is totally different to what we Gujju make Kala Chana Bateta nu saak, in near future will post my version of that recipe too, but today let's see Aloo Chole recipe. 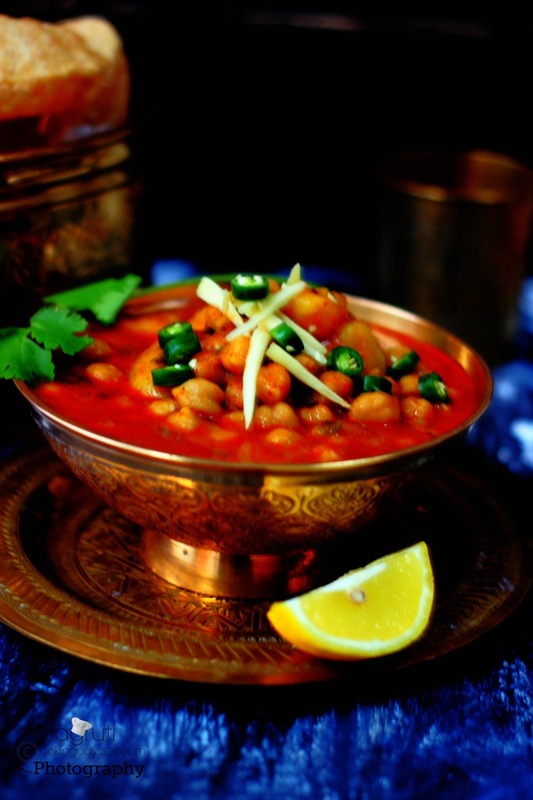 I have used white chickpeas and used some aromatic spices to enhance the flavours of this dish. 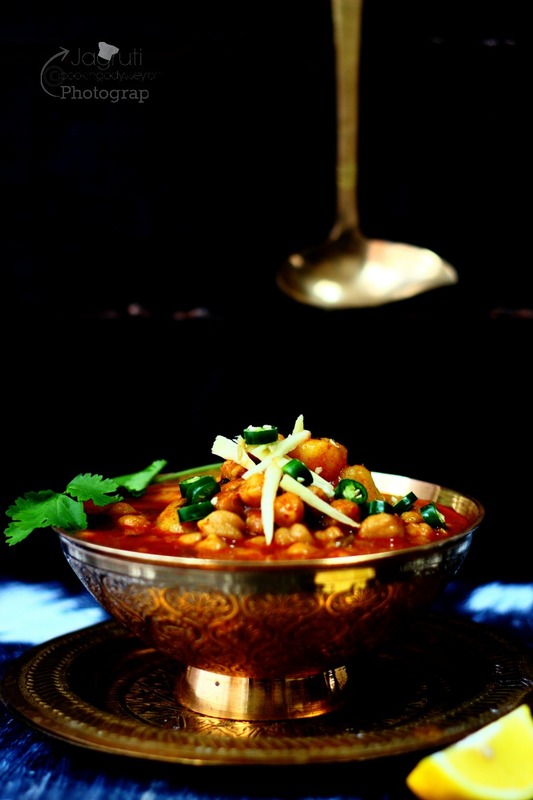 Aloo Chole is a delicious combination, devoured by young and old, cooked in tangy and spicy tomato sauce and flavoured with various spices. We devour this chatpata treat accompanied with Poori and Almond Halwa, the best combination of all :) Everything tastes of rich sumptuous and mouth-watering delicacies. 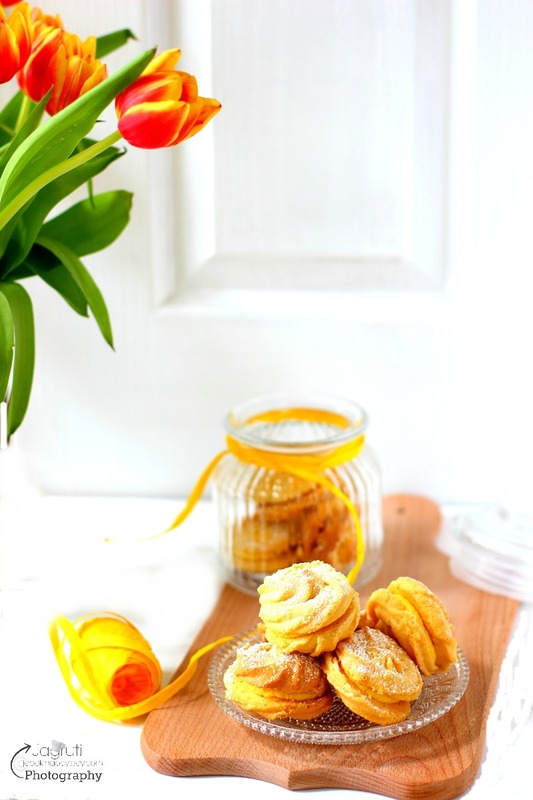 One good heavy breakfast or brunch which is our favourite and we only have on weekend mornings!!! Heat oil in a heavy bottom pan, add mustard and cumin seeds and whole spices. Once they crackle add hing. Now add ginger and chillies and fry just a few seconds. Pour in tomato puree and let it cook this mixture for 3-4 minutes. Throw in all the masala powder except amchoor and kasoori methi. Add kasoori methi and cook for 40 seconds. Now add chickpeas and potatoes and mix well. Add about 3 cups of water, season with salt. Cover the pan with a lid and let it cook the sabji for 20-25 minutes. Keep checking the level of water, if gravy is too thick add another half a cup of water. Cook sabji till potatoes are cooked but not mashed. Add amchoor powder and cook another minute or so. Best accompanied with Halwa and Poori.